﻿After his great success as a new discovery through playing on tour and in the studio with Art Blakey’s creative and inspirational group, the Jazz Messengers, Freddie Hubbard made a dozen LPs over 16 years for Blue Note and Impulse under his own direction. It was no wonder then that a big record company made him a lucrative offer in autumn 1966. All in all, Atlantic Records released six LPs and the very first, entitled "Backlash", is still until today the best of the bunch. 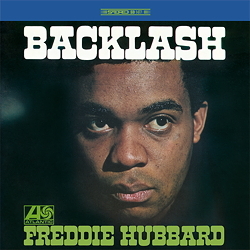 Three numbers by Freddie Hubbard, one by Bob Cunningham, and two by friends, provide the basis for a successful transition between hard bop and soul beat. Hubbard made high demands on his fellow musicians James Spaulding, Albert Dailey and especially the bass player Bob Cunningham and the drummer Ray Appleton because they had to cope with the ever-changing beat. Right from the very first note, it is obvious that Freddie Hubbard had Fats Navarro and Clifford Brown in his heart and fingers. All the titles are excellent. Of special note, however, is "Little Sunflower". The sound colouring of the flute harmonizes particularly well with Hubbard’s brass, and Ray Barretto’s contribution is more than mere decoration. You’re certainly on the right track with this LP, no matter whether it’s the beginning of a Freddie Hubbard collection or a further contribution to a large jazz collection.